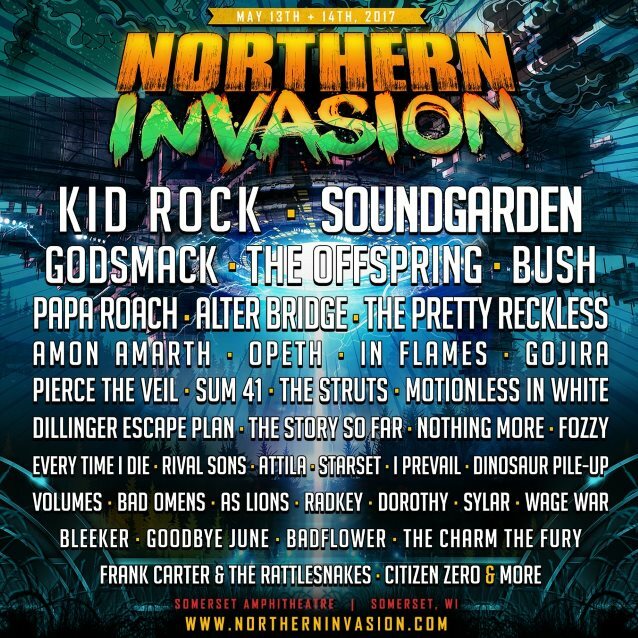 SOUNDGARDEN and KID ROCK will headline the third annual Northern Invasion, set to take place Saturday, May 13 and Sunday, May 14 at Somerset Amphitheater in Somerset, Wisconsin. Northern Invasion hosts the biggest rock bands for over twelve hours each day on three stages, and offers a top-tier campground experience. In 2016, Northern Invasion expanded to two full days. Gavin Rossdale of BUSH said: "We are so excited to come play the Northern Invasion. So many killer bands I want to see… starting with SOUNDGARDEN. We plan on bringing the fire." Presale weekend tickets and layaway packages, as well as hotel, camping and VIP packages, are available for purchase starting Tuesday, December 13 at 10:00 a.m. CST at NorthernInvasion.com. The layaway option allows purchasers to split the cost into four monthly payments. Those looking for an expanded festival experience are invited to purchase hotel, camping and VIP packages. Available camping packages (RV and tent options for 3 nights) include Groupie, Roadie, Star, and Ultimate Package at Float Rite Park. Hotel packages offered for 3 nights are: Bronze, Silver, Gold, and Platinum. All camping and hotel packages include a $25 festival merchandise voucher for each person. As in the past, General Admission ticket discounts will also be available for active military through Northern Invasion partner GovX.